Our tasks are varied and interesting as we transition from summer to fall. Here’s what we accomplished this week. Harvest, harvest, harvest. Many summer crops are still ripening (tomatoes, peppers) but the fall crops are ready too. Workers who joined us this year have little experience with cauliflower and broccoli, so they are learning these “new” crops. We harvested almost all the winter squash. I’m eyeing the sweet potato field. We’d like to get some dug this week. Till down finished crops. Wow, it’s a relief to finish off some weedy fields. The squash, melon and cucumber fields are done. The crew pulled out the drip tape and plastic mulch then Larry tilled, killing off many, many weeds. It was an instant farm make-over. Steve seeded the final vegetable planting: a field of spinach which will over-winter as small plants. It should be ready to harvest for the first CSA box next year. Steve cleaned and lubricated the planter and tucked it away for winter. It joins the transplanter and other tools that we’re finished with for the year. There is one more thing to plant (green garlic) but plant whole bulbs by hand and we won’t need the seeder. Plant cover crops. Lush cover crops of rye and hairy vetch are the backbone of our soil management system. They improve soil texture and fix nitrogen naturally for next year’s crops. Steve plants fields to cover crops as they are freed from summer crops. He’ll continue this job over the next month. Wrap up Bike the Barns. This didn’t involve much, just tidying the areas used for lunch service and putting the greenhouse benches back in place. The rental companies returned to pick up the tents, toilets, plates, tables, and an enormous grill rented to cook the homemade sausage. Host a field day for other farmers. We welcomed a group of 30 farmers for a tour and discussion. The topic was growing, harvesting and storing late fall crops for winter sales. That’s one of our specialties. Fix things. Larry got one of our pick-up trucks running again. The crew cheered. They have missed the vehicle during recent harvests. Steve and Larry worked on our root harvester today in preparation for the beginning of carrot harvests next week. The 60-year-old harvester needs to be in reliable shape for the rest of the fall, especially during November when we bring in our winter’s supply of carrots, beets, parsnips and other roots. 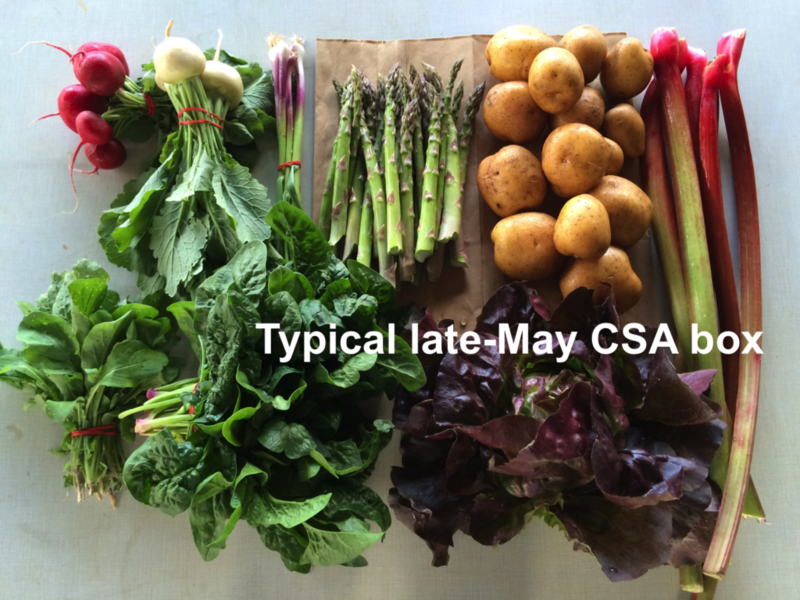 Pack CSA boxes for all of you loyal Tipi members! rain + hardy bicyclists + great food = success. Wow, the Bike the Barns (BTB) fundraiser through FairShare CSA Coalition was exciting this year. We hosted the lunch stop. Six hundred bicyclists registered and over 500 rode 30 to 70 miles through the rain. The riders remained in good spirits even after getting soaked. We cleared one greenhouse the day before the event, once we realized it was going to be chilly and wet. The dry greenhouse was a welcome place to eat lunch. Why do we host the BTB ride? We are happy to support fundraising for Fair Share’s “Partner Shares” program. This program supports CSA shares for low-income households, including some of our longterm CSA members who have turned to it during financial crises. I’m glad the program is there to help. Rented tents and other supplies arrived during beautiful weather on Friday. By Sunday the weather turned wet and cold, but didn’t keep the riders away. Ironically, that was our biggest rain in eight weeks. Cooks from Monty’s Blue Plate served lunch in our outdoor washroom. The ingredients were sourced from local farms. Our largest greenhouse was a warm place to eat. Steve (in yellow) did not get many takers for his farm tours. The sun emerged in time for the after party at Evansville’s Lake Leota Park. What’s up with the cauliflower?? Do you remember the cool nights in August? Well, our cauliflower and broccoli plants formed early heads in response. They are nice quality and very early. We will pack broccoli and cauliflower for everyone again this week. Basically, you are getting much of your October cauliflower now, so expect fewer heads in late October. On the other hand, the broccoli will probably produce steadily. Amazingly, even the Romanesco broccoli has formed heads. This is great news, as we often lose many Romanesco to frost before they can reach harvestable size. Superior white potatoes, 3.5 lb. Some members will get raspberries OR an heirloom tomato. Next week’s box will probably contain winter squash, peppers, carrots and more. Superior white potatoes – These are from Chris Malek of Malek Family Stewardship Farm. Chris grows all our potatoes. Superiors are excellent all-purpose potatoes, useful for boiling, baking, roasting, etc. They are a true Wisconsin variety and were developed at one of the UW research farms. Pak choy (large head with green leaves and pale green or white stems) – This Asian green is very similar to bok choy. Like bok choy, it is good for stir-frying or sautéing. It is also good in soups. You can think of the stems and leaves as two separate vegetables. The stems require longer cooking. The leaves will cook almost as quickly as spinach. Bok choy stores well, so feel free to pull off leaves as you need them, or use the whole head at once. Refrigerate in a plastic bag. Slicing tomatoes – Tomato quality is still good (thank you dry weather) so we continue to send them. Red bell peppers – Many of these are a small but flavorful variety called King Crimson. Cauliflower – Some heads are yellowish because they were exposed to sun. The color difference is harmless. Romanesco broccoli (pale green conical head, possible tinged with purple) – Only one site will get Romanesco this week. This is one of our prettiest vegetables. Look at it closely to appreciate its branched beauty and repeating spiral pattern. It is called broccoli, but is closely related to cauliflower which it resembles in flavor and texture. Like broccoli and cauliflower, it is fine eaten raw or cooked. It requires cooking times intermediate between the two. Don’t overcook it. I usually steam it, then dress it simply with a butter-lemon-garlic-mustard sauce. Both chilis are of medium heat. Both are easy to peel once roasted. As usual, the heat is concentrated in the seeds and midveins. Remove the seeds and midveins is to lessen the chili’s heat. We roast these chilis and add to many dishes: tomato soup, salsa, lasagne or other casseroles, etc.